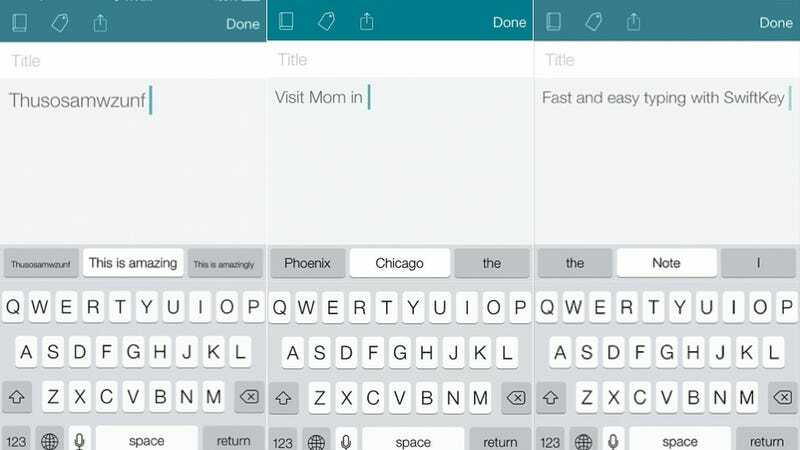 SwiftKey is one of the best keyboard replacements you can get on Android, and now it's bringing its note-taking talents to iOS with the launch of a new app called SwiftKey Note. Now, its not a keyboard stand-in like its Android brethren—iOS makes that impossible—but the in-app keyboard includes many of the same predictive features and it's certainly a step up from the stock iOS Notes app. Available in iPad and iPhone flavors, the new app has three next-word suggestions, personalized autocorrect, and a system that learns more vocab and adapts to the way you write the more you use it. The app is built with Evernote, so you can automatically sync your notes to your account. It also features sharing via AirDrop, Messages, and email. Oh, and if you habla español, or another language for that matter, you'll be glad to know that SwiftKey lets you work in as many as three languages at a time. Yes, talking about note taking apps is definitely mind-numbingly boring, but this app is great. And it's free from the App Store starting now.